Accessories: Accompanied by Rolex blank guarantee and presentation box. 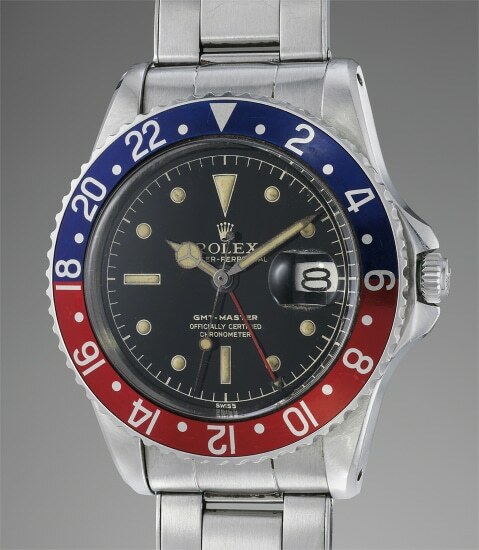 Reference 1675 was introduced in 1960 as the successor of the reference 6542. Early examples, such as the present watch, featured pointed crown guards. The steel insert did not carry radium, which by then was considered a health hazard. This early reference 1675 displays pointed crown guards and a "Swiss" stamped dial which is correct for the period. The "Officially Certified Chronometer" chapter ring dial is correct for the serial number and still remains glossy and mirror-like, which is remarkable considering the age of the watch. The case is furthermore preserved in excellent condition with sharp bevels and crisp edges throughout. The bracelet is also from the period and is preserved in excellent condition.